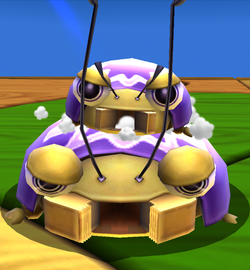 The Stink Bug Parent is a mini-boss appearing in Super Mario Galaxy and its sequel. It is a normal-sized Mandibug with a smaller Mandibug on its back. It acts as a mini-boss in each game it appears in. The Stink Bug Parent is encountered in the Honeyhive Galaxy mission Trouble on the Tower. To defeat it, Mario or Luigi must first squash the offspring on top with a Ground Pound. Upon doing so, the Stink Bug Parent will become angry and approach Mario faster than a regular Mandibug. Ground Pounding the parent as well reveals the mission's Power Star. In Super Mario Galaxy 2, the Stink Bug Parent is present in the Puzzle Plank Galaxy mission The Puzzling Picture Block (after the puzzle on the final planet is solved). The enemy behaves and is defeated the same as in the predecessor. It shares its boss theme with King Lakitu, which in turn is a variation of Baron Brrr's boss theme from Super Mario Galaxy, unlike the first game, where it has no theme at all. This page was last edited on March 5, 2019, at 15:41.